Origin: Uncertain; no marks; perhaps German (Berlin? ), mid-19th century. Commentary: First published in Read 1902, where it was also illustrated, this tankard was then described as a “Dutch silver tankard, about 1680” and the camp scene was identified as a “night attack”. Furthermore, it was suggested that the principal figure on horseback was “probably the Stadtholder (after William III, of England)”. This description and attribution were subsequently repeated in Dalton 1927. (i) The cutting off of the 'frieze' or pictorial scene (normally running completely round the body) by introducing a frame to create an irregularly shaped reserved area on either side of the handle. (ii) The use of a 'dot-and-lozenge' motif to decorate that frame. (iii) The choice of an eagle handle with outspread wings and, below, a grimacing mask terminal with a curly wig (?) and two detached leaves. (iv) The hinging of the lid by attaching it to the wings of the eagle, which are pivoted through the eagle's body. (v) The linking of the top of the handle to the body of the tankard by a horizontal bar (hidden by the wings of the eagle). (vi) The curious combination of acanthus, oak and laurel. (vii) On the cylindrical body, the strange mixture of Roman-style armour, mid-seventeenth-century-type armour and neo-Gothic plumed helmets. (viii) The absence of reins on the galloping horses, except for the horse ridden by the commander. (ix) The introduction of 'oxidised' silver on the domed lid as a background to the military trophy. Of these nine major features, all unique to this tankard, perhaps the last is particularly significant: 'oxidised' silver is a term commonly used to describe silver that has been coloured black or dark grey, using a chemical process by which the surface of the metal undergoes a chemical change. Silver can be coloured black by immersion in a potassium sulphide solution; by removing the silver at an early stage and rinsing it immediately in water, a dark grey colour can be obtained. This technique was much in vogue among jewellers in the nineteenth century and, essentially, the inlaid roundel set in the lid of this tankard is more a jeweller's creation than a silversmith's work. Equally important is the design of the handle, which may have been indirectly inspired by Paris work of the Napoleonic period but which has a far less well-disciplined quality than the Empire-style prototypes. Although extremely ingenious and technically very fine, this solution would seem to be out of character before the mid-nineteenth century and, therefore, to complement the camp scene with its eclectic borrowings that have led to the series of incomprehensible inconsistencies described above. The composition is a strange nineteenth-century melange - a typically romantic historicising vision of the battle and of knightly bravery earning the laurels of victory. Even the trophy of arms on the lid lacks the restraint of the eighteenth century, and the design has become over-heavy and ornate. In the use of inlaid mother-of-pearl there may be seen, perhaps, a continuation of a long Germanic tradition, which in Saxony, for example, particularly at the Dresden Court, stretches back through the workshops of Dinglinger (c. 1700) to the sixteenth-century masterpieces by goldsmiths such as Elias Lencker, whose great silver and mother-of-pearl Calvary entered the Grünes Gewölbe soon after it was made (c. 1575). In conclusion, there is no reason to regard this tankard as a forgery. It cannot be classed as a fake if the intention was not to deceive. Its attribution to a Dutch workshop in the late seventeenth century was probably a later owner's suggestion. Indeed, it seems to be a straightforward example of its kind, demonstrating the better aspects of Historismus. It combines both originality and fine craftsmanship, although its design is marred by certain weaknesses, such as the crude mask terminal to the handle and the feeble composition of the camp scene. Because of the puzzling lack of any punch-marks, its precise origin may continue to elude the historian and so prevent its full importance for the study of nineteenth-century 'historicising' silver plate being properly assessed. The traditional Dutch origin ascribed to this tankard has been rejected by expert opinion in Holland; its place of origin probably lies in Germany. Although English goldsmiths of the mid-Victorian era were engaged in 'historical' creations of a related character, their works are usually hallmarked in the normal way. 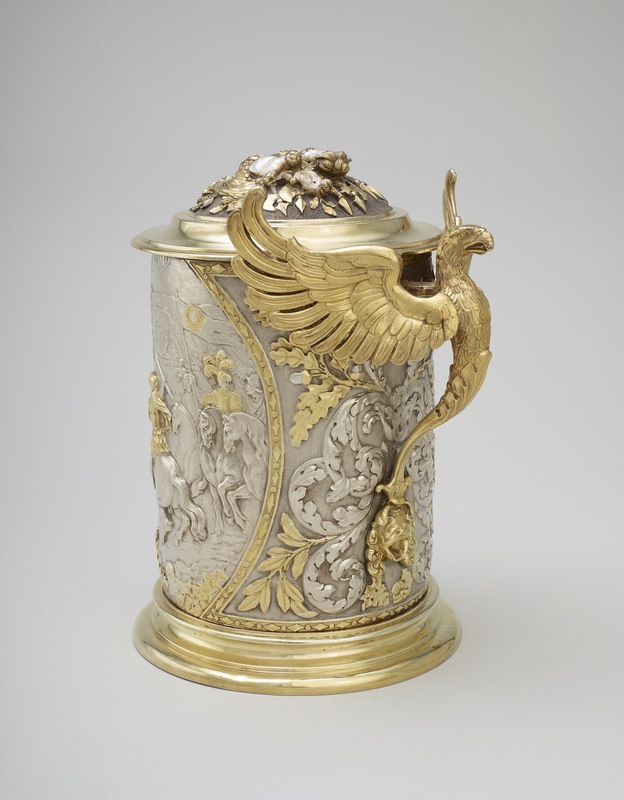 The creation of this tankard without assay marks or a maker's mark might occur on the Continent in response to a special commission in the mid-nineteenth century, and so an attribution to a Berlin workshop has here been tentatively suggested. Hugh Tait, 'Catalogue of the Waddesdon Bequest in the British Museum, II : The Silver Plate', British Museum, London, 1988, no. 61, figs. 356-360.